KD Suite is a brand-new Kindle publishing product release from software development powerhouses Dave Guindon and Bobby Walker. This is a powerful 3-part publishing software suite. We were lucky to receive a review copy and have had a chance to test it out last week. Overall, we’re very impressed with this collection of software tools. In a nutshell, KD Suite makes performing niche research for Kindle publishing much, much easier.The suite is comprised of 3 pieces of software, KD Bestseller Analyzer, KD Search Analyzer, and KD Ebook Marketer. The first two are designed to help find profitable niches in Kindle publishing. KD Bestseller Analyzer has a number of powerful features, but it primarily allows you to search Kindle categories so you can find which categories are selling best overall in the Kindle Marketplace. You can also narrow down a category by a keyword, or you can select a specific category or categories. In addition, you can then take that keyword/category and it will pull up the number of books you specify that are the top-selling books for that category. These last two are based on algorithm projections. In the help video that comes with the software, Dave explains how his background as an engineer and researcher helped him create this algorithm. This is a powerful indicator to help determine profitable categories and niches. 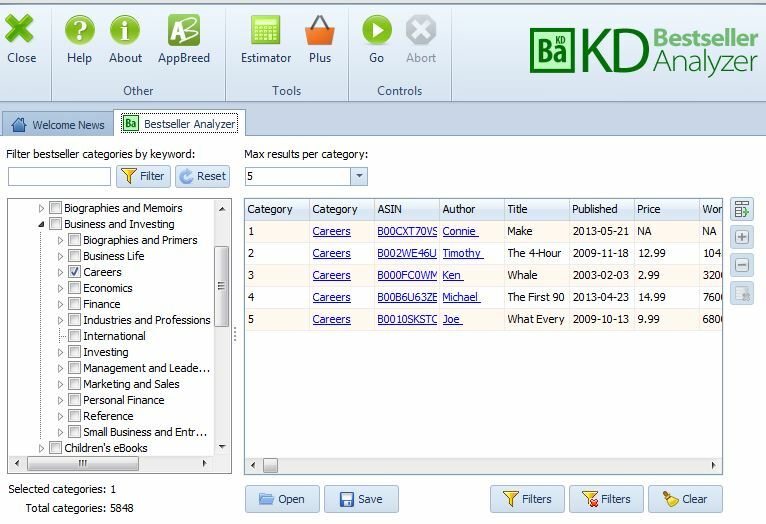 KD Bestseller Analyzer also has a number of other cool tools, such as allowing you to find books other people bought when you select a specific title. With this research, it becomes much easier to find niches that are selling, and see the characteristics of the best-selling books. The 2nd piece of software, KD Search Analyzer, is similar, but it pulls up books based on keyword rather than category. This is great if you are doing keyword-driven research first, (such as Google search results), and then want to take it to Amazon to see if these keywords are selling as Kindle books. One thing it also does is automate the process where you find related Kindle searches with a seed keyword. For example, if you have a keyword like ‘dog training’..it goes through the alphabet..dog training a, dog training b, and pulls up the related keywords that people are already using on Amazon to search for books. This will help you easily find keywords people are actually using on Amazon to find Kindle books. 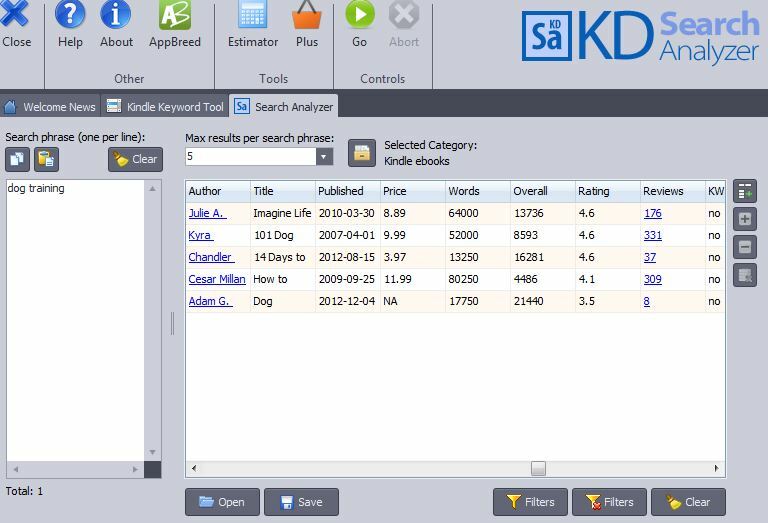 Then, KD Search Analyzer will also analyze those keywords and find the related bestselling books with the same pertinent information as what the Best Seller Analyzer pulls up. This is also a great tool for also finding keywords that you can use in your title and book subtitle.These two pieces of software are incredibly powerful for drilling down related niches and doing niche research, much quicker than doing so manually. The 3rd piece of software is called KD Ebook Marketer. 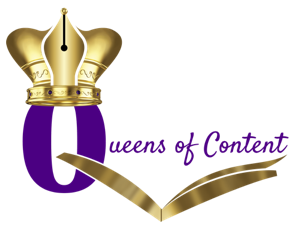 It consists of two parts, a tool that helps you find reviewers on Amazon, and a tool that helps you post your book link to social media sites. We weren’t as excited about this tool. Full disclosure, we are biased toward our own stellar piece of software (Publisher’s Review Accelerator) that helps find reviewers in your niche. While this is similar, with KD Ebook Marketer,you have to input individual AISN’s to pull up the reviewers, whereas ours will pull up all the reviewers automatically by related keyword. The other part of the tool allows you to create sharing links to your ebook you can share on different social media sites. However, because you get all three pieces of software for one extremely reasonable price, the Ebook Marketer module isn’t bad as an add-on. The complete software suite also comes with complete training on how to use the software and some training on how to find niches and market your books. This is incredibly powerful software for finding viable and profitable Kindle niches. If you are looking to expand into publishing or want to increase your Kindle profits, KD Suite is a must for niche research. So far, we think its the best Kindle niche research software now available on the market. Bottom line, we’ve tested and recommend this software for powerful Kindle Niche Research. Bonus: If you purchase this software through our link, we have an exclusive bonus for you: Kindle Lead Generation Secrets. This is a brand-new, never published report and case study, from us (Amy and Deb), where we show you how you can successfully publish Kindle books that also earn you additional affiliate income. This is a very powerful technique that comes with a behind-the-scenes case study, and it will not be released to the general public! Its a 30 page report of our success. And you’ll receive the bonus automatically after purchase, if not, follow the directions on the bonus page above to receive your bonus.